This is my account of a coast-to-coast walk across Wales. A 290 mile route through the most mountainous and wild parts of this beautiful nation. The Cambrian Way is an unofficial trail that connects Cardiff (south coast) to Conwy (north coast). Snaking for over 290 miles, this route reveals the wildest depths and heights of this country, and includes two and half times the ascent than Everest. 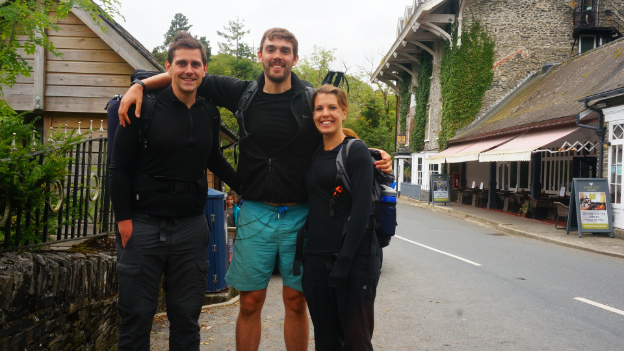 Having never crossed a nation on foot before, I decided Wales would be an exciting place to do it – and it was! A full guide to my equipment and route are on separate pages. My account – which I tried to keep short – is below. It was dusk. 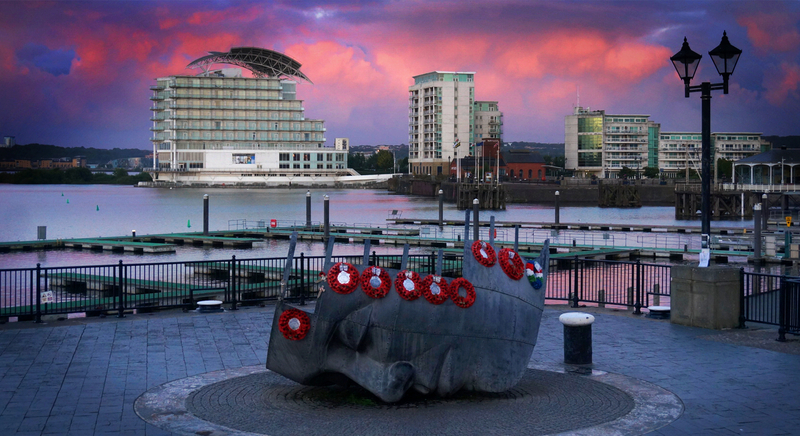 We drove into Cardiff docks at 5:30am. David had put me up at his place the night before and had drove me all the way from Cheltenham, a favour I am still hugely grateful for. We had watched the sun rise as we talked rescue strategies. David is a long-distance walker and it was nice to start with someone who knew what this was all about. We pulled up in town. Cardiff docks was gloomy, but less industrial than I expected. Vacant fairground rides stood by the National Assembly for Wales and the city stadium. It had at sometime been the subject to regeneration. Security guards on their morning shift watched my every move as I prepared my kit for walking, and I wandered the harbour to see a few sights on the concreted shoreline before I began my long and potentially difficult journey. At 6am I began my walk with full spirits. The lightness of my pack was pure joy. I launched into this walk far more easily than Cape Wrath – no ferries to catch, just a walk straight out of town to the North coast. The trail took me through the main parts of the city, and by the time I had reached the main park the joggers were already wiggling around the paths. The Taff Trail runs through a wooded valley, and this is the route I would take. But it is bisected by motorways and retail parks. The trail was not well considered in this highway plan. To be honest, skipping this section could have been more enjoyable, but it would not have been a coast-to-coast walk without it. I had camped just after Pontypool after a big day. I was half a day ahead of schedule. Abergavenny was a really nice town to visit. There was a decent size river running through it, historic buildings and well-kept gardens. I took some time out to visit the Antiques Fair in the Town Market, resupply and buy a fleece. I later walked directly to Llangattock, bypassing the long dog-leg that ventures off to Lord Hereford’s Knob. This reduced my walk by at least a day. I sauntered through Llangattock to find most places shut (Sunday) but the petrol station had food. By 5pm I was heading up a long steep road into the hills. By 7pm I got to the top of it and it was now drizzling. The light was going. All vehicle tracks will inevitably lead to a road, which means people and safety. I felt this was the best and only way of escape. I was over-enthusiastic. I walked myself into the moorland plateau on the hills. But after an hour my navigation failed me, although I had walked in the correct direction the now path ended. I began following 4×4 tracks that then abruptly split in two. At this point I had lost my exact coordinates, it was dark and raining heavily. My clothes had wet through from water ingress. Making an informed decision on where to go was impossible. I tried to check my phone for GPS but it failed. I put an exit strategy in place: to follow the 4×4 tracks to wherever they went. All vehicle tracks will inevitably lead to a road, which means people and safety. I felt this was the best and only way of escape. After an hour and a half of blindly following the mud tracks they began rolling down the hillside. By torchlight more features of a fence emerged. The track deepened, indicating more frequent passage. I was confident I was going to safety. Then I saw a flash of car headlights 500m away, I was near a road at least. Then several floodlights appeared, and the silhouettes of farm buildings drifted forth. It was still so dark I could not pinpoint where exactly I was on the map. After several hours in the wet I was cold, and tired. I pitched my tent against the wall of a sheep pen, hoping that in the morning it will have stopped raining and that I hadn’t strayed too far off course. I woke up in my bivvy bag soaking wet. The rain had permeated through all my layers but luckily my down quilt was reasonably dry. I had slept a mere hour or so and I had no idea where I was. I was next to farm buildings and I could see a road. I scanned the map for similar landmarks and discovered I was in the quarry village of Trefil, just 2.5km off course. It was a small village, and the greyness of it was echoed in the weather. It had been a rough night but I felt proud at how I had steered through the situation calmly, reaching safety. I followed the Northern quarry road. I was actually not far off the trail and I resumed it fairly easily. 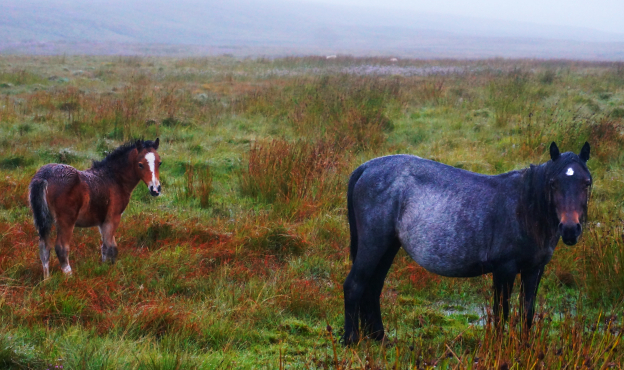 The roadside was dotted with Welsh ponies, sodden and cold. What tough creatures these must be to survive in this place. A mother and her foal, looking pensive and pregnant, stared at me with mournful eyes. The ponies are more braver of humans than deer or sheep, though still smaller than reared horses they are still majestic, impressive animals. This walk was the start of The Brecon Beacons National Park. I saw a plaque dedicate to Nye Bevan, former prime minister and founder of the National Health Service. The quarry land had wide HGV tracks but was difficult to navigate with no clear signs. My map for this section was now wet and crumpled forcing my navigation to rely on guess-work and intuition. This area is less than beautiful. It is a post-industrial wasteland. Strange, half demolished outbuildings sat in the cliff faces – a landscape ripped apart by machines. The trail as it transpired follows the main quarry track through this range. It was not the most enjoyable or beautiful part of the walk, at the very least it was interesting to get a feel for the men that worked there. But because my map was unreadable it took me nearly three hours to bypass. The weather changed from grey gloom to sunshine when I exited the quarry. I still had no map but I spotted a reservoir deep off the hillside and this was a tell tale sign I was where I needed to be. A range of three sharp peaks in the distance were undoubtedly the Brecon Beacons. Something crept into my peripheral vision, and to my alarm, it was an Alsatian dog. I looked round to see a Police Officer standing over me. As I drew closer to the reservoir I heard the hoots of a steam engine, which told me I was at Pontsticill. High on a hill., I had a panaromic view of the area and the reservoir was vast. I made my way down towards it sheepishly skirting the edges of farmer’s fields. I made my way to the water’s edge where a local told me I could cross over a dam at the North. This got me to the other side very easily and I arrived at a narrow road that would take me back on route. At 6pm, I cut the walk short and I wild camped in gorgeous forestry just north of the reservoir. I found an enclosed spot next to some tall pine trees and a water source. I took a nap here to reserve my energy but an hour later I was awoken by the feeling of a presence behind me. “Don’t worry about her”, he said, “I’m taking her out for a walk after work”. I sheepishly offered to move on (wild camping is not permitted in Wales). But he told me there was no problem, and joked that, “She’s never seen a tent before!”. The officer left me without any trouble. I thought that he was very understanding. To me, this is an indicator that Wild Camping in Wales is generally tolerated as long as you are a responsible. Only a landowner can move you on, and even then it can never be more than a civil offence. It was a solid walk up the ‘horseshoe’ path that reminded me of walking in the West Highlands. I met a couple of nice gents, a father and son who were doing the circular walk. They seemed transfixed about my story of walking across Wales. The enthusiasm of others really does spur you onward and upward. I left them with a smile and walked on. 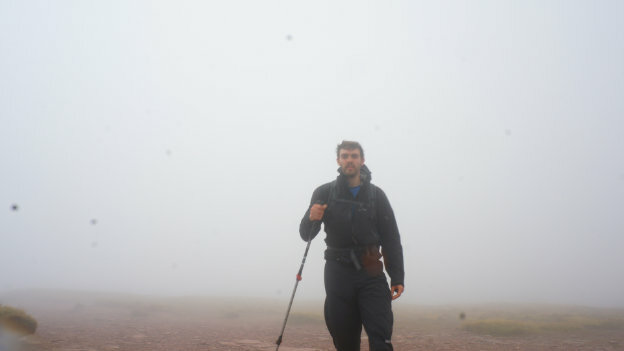 Pen-oramic – a very typical view of fog from Pen y Fan. The ascent up Fan y Big was not too hard at all, there is a Bridlepath that bypasses the summit, contouring gently around the south side. The ascent up Pen y Fan, however was steep with slab stone steps, mist and crosswind. I met two workers on the way up who were rebuilding the steps with just hand tools. They were thin and emaciated. It is easy to forget the work that goes into conserving our National Parks and trails and just how hard this work is. Two workers on the way up who were rebuilding the steps with just hand tools. They were thin and emaciated. It is easy to forget the work that goes into conserving our National Parks and trails and just how hard this work is. Pen y Fan was misty (as expected) and I didn’t hang around for the view to emerge. I set my bearing and found the main track down to Storey Arms. I emerged to see hundreds of holiday makers in all their colours puffing and panting up the path – a real shock! Why do they all come to the same place? 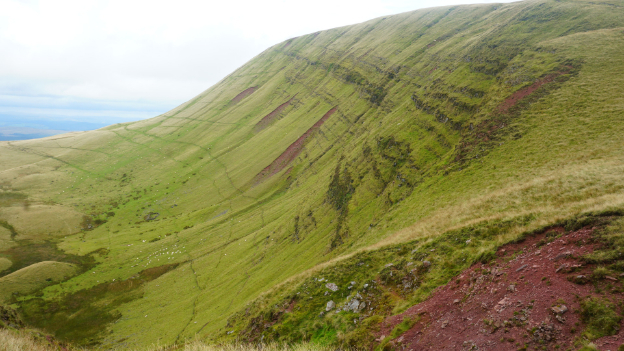 Pen y Fan is not a pretty or exciting climb. Its a tough walk that is not child-firendly. I decided to run down the path to avoid the hordes. And dare I say, It felt pretty exciting. 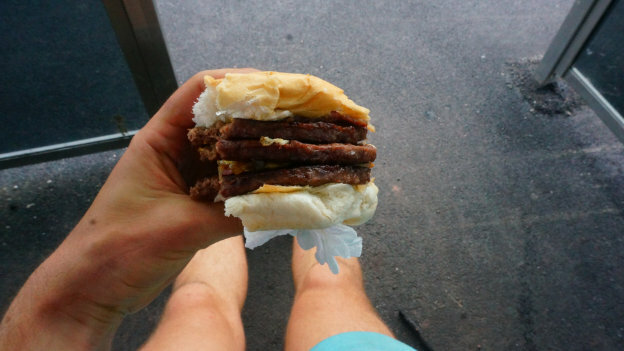 The unforgettable ‘mega burger’ from the Storey Arms burger van. At the Storey Arms Centre there was a burger van. As it was still afternoon, I set my compass for the path heading West over the hills to get more walking in. As expected, just 500m from the road, I was soon back in complete isolation without another walker in sight. It is bizarre how tourists will all flock to the same locations to experience ‘wilderness’! This was enjoyable walking over thick grass moor. There were boggy parts but could be spotted a mile away. The path wrapped around the sides of the hills. But it was here that I misread my map and spent 1hr30 walking down the wrong valley. This was a typical mistake of trying to make the landscape fit the map. I realised my mistake and was left demoralised by it as I trudged back at pace. I retraced my steps and walked up to a broad ridge with a track. This was okay to get a good pace up and soon I went up and over the hill and arrived at a motorway. I had decided to follow the path here and then decide where to camp. There was nowhere here. So I walked an extra 3km south to Glyntawe. I arrived at Glyntawe to find the pub open. A slightly shirty sign at the door said, ‘LEAVE MUDDY BOOTS AT THE DOOR’. Seeing as my socks were in a worse state than my boots I left them on. It was a nice bar with a few locals laughing with the owner, but they kept staring begrudgingly at my boots which I swear were perfectly clean! They served very nice food though. The owner provided camping in a small field next door which is slightly overpriced for what it was but I was grateful for a hot shower and somewhere to handwash my clothes. I was now in a better state than the night before. I left the campsite after washing my clothes. I wore my clothes wet for the hardest of ascents up the Black Mountains. Wearing wet clothes kept me cool. A strategy that saved me from heat exhaustion on several days. The black mountain range were an impressive, velvet green escarpment that could have been drawn with perfect bézier curves. I loved this section. It was impressive, beautiful and panoramic. The hills here are the tallest in Carmanthenshire which means incredible sweeping views. It is an area I will definitely visit again. I experienced severe thigh cramp from the previous days exertion and it was slow-going. I was disheartened by a trio of men who took great strides past me. Here I decided to take lowland route as I couldn’t handle any more hills. I exited via a large lake which was an impressive sight and made my way to LLanddeusant Hostel. It was fully booked, but was a lovely, basic little place. I walked onward with circles of red kites circling above me. I soon noticed that I was near The Red Kite Feeding Centre and by the end of the day I had counted about 60 kites. 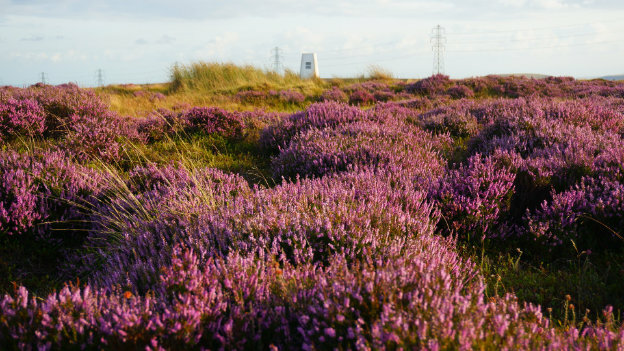 The species have made a remarkable recovery here, in the 1960s there were just 20 breeding pairs in the whole of the UK. Although I had stiff legs I did another 6 miles of road walking. My feet were playing funny games and I was walking like John Cleese in the ministry of silly walks. This was a very remote, rural part of mid-Wales. Not many cars, mainly shepherds whizzing down the lanes on quad bikes with their sheepdogs standing on the back wobbling about. I saw a shepherd with no less than three dogs balanced in his bike as he zipped through the village of Middfai. I eventually reached Llandovery campsite. The Co-Op is open late and so I consumed its delights in my tent, having showered and massaged my legs to ecstacy. In the morning, I chatted with the campsite warden and she was really lovely and helpful, making me a warm cup of tea. She told me that hundreds of people come to do the Cambrian Way every year, although I was not sure of her figures. There is very little talk of the trail online and I wondered if she meant the Cambrian Range instead. Llandovery is nice old drovers’ town and there was an ironmongers where I bought a replacement trekking pole. A man at the local cafe kindly made me a sandwich to go. Now, this is an admission: I was very cheeky here and I took a train. My tired legs were slowing me down, so I took the train just one stop, saving me about 2 hours. I only went one stop, the Ticketmaster kindly waived my fare. It was a cheat but not a big one. 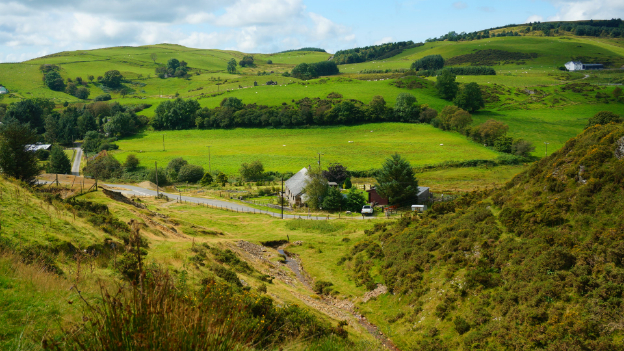 I arrived at Cynghordy, where there is mainly farmland. It was tricky resuming the path from here and I had to knock on someone’s door. I was surprised to be greeted by an American woman who told me her house was right on the Cambrian Way and I had to walk through her garden. This section of path is very long. It is a lowland section of the route, crossing no mountains and no resupply points. I can only assume that this valley is just far too narrow and winding for a road to be here – that’s why it’s left wild. I really enjoyed this section, feeling as if I was the only person there to enjoy it for a whole day. I later camped in a nice spot next to the path around 8pm. Further on this path it became more hilly and I was soon in waist high grass. At some point I dropped my map. I spent nearly 40 minutes searching for it. Luckily, I had already set my compass bearing on the phonebox on the road so my only desperate hope was to reach that then hope for something to happen. After trudging 20 minutes through deep bog I arrived and a stroke of luck happened. A car pulled up just as I did and out hopped a couple of walkers. I asked if they had a map, and they did, they had two copies of the same OS Landranger! The man sold me it for four quid and the lady even gave me some fresh water and an apple to boot. I do believe that these small blessings happen when you are most in need. Without a map I would have had some real problems. I walked with them happily for a short distance and then we went our own ways. Walking from here was difficult and I need to locate several cairns to find the path. But the farmer had recently re-fenced the area and the map was all wrong. I did eventually make my way through the twisting hills, but I was not aware of how high I had climbed until I saw the descent towards Strata Florida Abbey near Pontrhydfendigaid. The view of the rolling countryside was gorgeous here. I was tempted to visit the Abbey but didn’t, instead heading straight to the Post Office to resupply. They had a good amount of food here. A local lad came by and sat on the bench with me to adjust his shoelaces. I explained I had walked from Cardiff and he stared at me blank-faced in disbelief. Then he laughed, raised his trouserleg and showed me his leg, “I can barely make it to the shops!”, he said. His leg was made of aluminium. I made my way out of the village. Navigation was difficult here, and there were no footpath signs. It involved criss-crossing over several farmer’s fields which always makes me feel uncomfortable. I eventually found myself in a fallow pasture next to a quarry that was not overlooked by buildings. I slept here in my bivvy, without putting up a tent. I needed to get to Devil’s bridge for 10am to meet my friends David and Nicola. They kindly drove in to resupply me with food and support me by walking with me for a few hours. I have to admit that this was my favourite moment in the whole walk, just by spending time with human beings you realise who you really are again. Their presence was infinitely comforting. With friends at Devil’s Bridge. David found me drying my socks in the public toilets – “who else would be using a hand dryer at 9 o’clock in the morning?”, he joked. And we met back at the car. I filled up on fruit and veg – a huge luxury – as well as clean water. Seeing friendly faces did wonders for my morale. After a pit-stop (“Pete-stop”? ), we walked around the valley, crossing over on a high iron footbridge. The woodland here is gorgeous and the peaceful calm was broken only by the impressive waterfalls and the sound of children playing near them. David and Nicola left me here; floating in the mountains, on a sea of green and purple heathers. After a couple of hours, David and Nicola sadly left. I had been well-fed, watered and generally made much perkier. I felt blessed. I walked onwards through a from to the George Borrows hotel. The sign said food served all-day but they only had ice cream, (I did not complain!). After this energy boost I made a b-line for the reservoir at the base of Pumulon – the source of the rivers Wye, Avon and Severn. This vast area was very Scottish Highland-like, an excellent place for exploring. 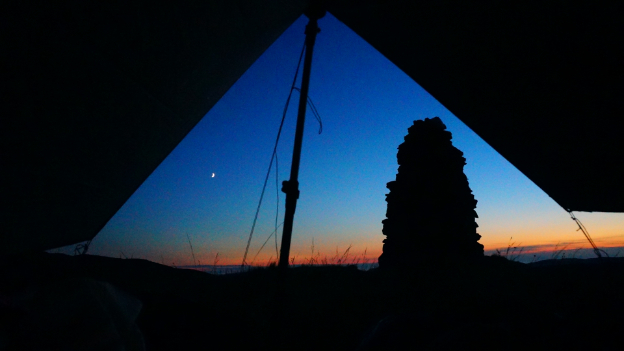 Once I reached a peak overlooking the valley I settled down in my tent for the night, to the view of an epic sunset. View from tent near summit of Mt Pumulon. Large reservoir on the Glyndwr’s Way. Very hilly. Took a lowland detour that only just paid off. There was an injured rabbit by side of road I visited a tiny pub on the Glyndwr Way which must have been Wales’ smallest pub. Penhros Arms is a lovely pub for a stop off although it is off the main route. I met an elderly Welshman here that was really nice to talk to. The staff all talked in their local tongue and the food was decent. They gave me a number for a taxi. It was very late to walk along an arterial road to the campsite at Dinas Mawddwy. Eventually the taxi arrived but although he carried me a mere 5 miles the ride cost me twenty pounds. I think the taxi driver was keen to exploit the tourist season. Cadair Idris was my favourite section of the walk. I met lads from Outward Bound. They were carrying an obscene amount of equipment – most of it from the 80s. Helped set their bearing. I saw my first glimpse of the West Coast here. Barmouth is a funny little town. I got the impression that this place is overrun in the holiday season and probably dead in the off-season. But there are plenty of amenities including b&bs. Unfortunately, I arrived before midnight and there was no where to stay. I tried to camp on the beach. This was a bad idea. When it started raining, the sand became sticky, which got inside every part of my equipment. My tent did not stand up to this treatment. I trudged back over the railway bridge whence I came and I slept at the only sheltered spot I could find in the dark – sadly – the disabled toilets on an abandoned railway line. This was an embarrassing and depressing experience. Definitely a low point of the walk. I rested for most of the day at a b&b. Later, I took my clothes to the launderette and got resupplied at the Co-Op. The only outdoors shop was a Regatta outlet that sold only clothing. Barmouth is a fine place for a day but I wasn’t impressed enough to want to stay any longer. That’s possibly because of the mood I was in from walking 180miles and having slept in a toilet! The high-level ridge path toward the Rhinog mountain range. The journey up into the Rhinogs was a steep road from Barmouth, right up until you approach the valley. Here I ascended higher up the side of the hill and rounded the contours. As I walked I watched two shepherds on either side of the valley herd hundreds of sheep from their disparate locations into a single file toward the farmstead. The control over their dogs with gruff yells and persistent whistles was mesmerising. The Rhinogs become steeper and the walk takes you right over each of the Rhinogs. I admit that I couldn’t see a clear path over Rhinog Fawr or Fach. They looked steep, rocky and aggressive. For safety, I camped beside the lake that night – early, for a good rest. Around the lake lived a group of mountain goats, their grunts and bleeting echoed around the cavernous space, and if you were not paying attention you could mistake them for a woman’s cry. The goats were braver than the sheep, unimpressed by my presence. They seemed wiser than sheep, yet slightly madder too. Their little beards swung round under there chins, reminding me of a gathering of little old wizards. 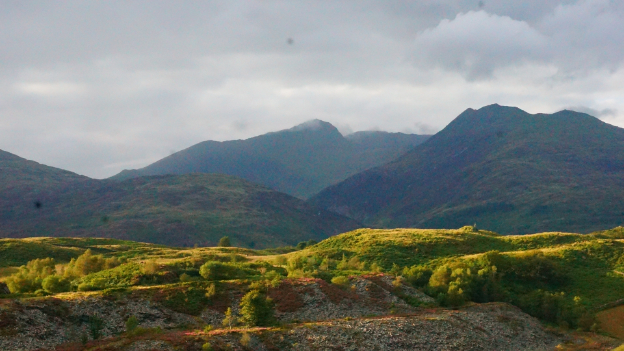 Approaching via an alternative route from the South provided a cathedral-esque view of Snowdon in the far distance. I exited the Rhinogs and went down through a National Trust forest. Then I waded through 2km of squelchy long grass to the reservoir. Here I crossed a farm to hear a vehicle coming from behind. When I turned to let the car pass I saw it was an eight year-old boy driving his father’s tractor. What a childhood! I crossed the dam. Then it was a walk through pretty woods and pretty gardens. I admit I don’t remember much of this precise route. I made most of this part up and I went via Croeso village where there is a cafe. The official route goes to Beddgelert but I am glad I skipped that, as I approached Snowdon with a perfectly framed view of the South side. This felt much more cathedral-like than if I had come from the West. I had hoped to use the bunkhouse at Dinas Bryn but it was full to the brim. I instead looked around for a camping spot. I was surprised to find a National Trust camping site called Llyn y Hafod here, not marked on the map. The campsite warden was a really lovely lady, a real gem who gave me newspapers to put in my boots to dry them out. We chatted about the best route to climb Snowdon. I left the Hafod y Llan campsite at 9am. I wanted to conserve my energy for this Snowdon so a later start was welcome. I had actually hoped to the do the Westerly the ridge walk which looked gentler, but somehow I was sucked into the steeper Watkin path. This was ok, I was quite fit by now and many of the other walkers smiled at me through gritted teeth as I went by! The summit of Snowdon always stuns me, not because of the view but the commercialisation of it. You realise that it is site to a large cafe that has the feel of an airport terminal – and there will always be around 200 people on the summit on a busy afternoon. Such busy-ness creates an unnatural feeling that is a shock to the system. As commercial as it is, I was very happy. I arrived cold and wet at the top and enjoyed a hot drink and several sausage rolls. I did not realise how exhausted I was until I stepped into the Cafe building. Regardless of the state of Snowdon, it is still a true and difficult mountain climb. I was proud of it. The descent down the Pyg Track was rocky and hard on the knees. This was not something I could roll down in a quick jog like I had done at Pen y Fan. Most walkers will know this route so I won’t go into much detail. I arrived at the legendary Pen y Pas YHA to find the restaurant empty so I ordered a two course meal. The Manager was very knowledgable of the area and helped plot my route from there to Ogwen valley – I was impressed by his knowledge. I left Pen y Pas fairly late, around 5pm, which is an uncomfortable time to ascend into the hills to do a valley crossing. I have got lost in the Glyders before and its an unpleasant place to be trapped in deep fog. But the instructions I had got from the YHA helped, and by now my navigation was on form. I found the peak of Glyder Fawr very easily – the key was to keep going up! Glyder Fawr is a mesmerising, alien scape. The standing stones of which the ranges gets it name are very strange to encounter and you wonder they ever got there. I did not have time to walk the ridge to Glyder Fach although having done it several times before I didn’t miss out. Instead, I continued Northward down to the staircase at Devil’s Kitchen. The start of this is easy to find as it is marked by the medium-sized lake, Llyn y Cwn. The staircase itself is really tough on the knees, so mine got two hammerings of steep descents this day. But the walk around Llyn Idwal is graceful and pleasant. If you arrive in the day here there is a cafe with hot drinks and cakes. Next door there is a disabled toilets with shower – an amazing discovery for a cold, wet walker. I was greeted by a familiar face at Idwal Cottage – the nice lady who is Warden there. The YHA itself was full when I arrived but she had camping space outside. This at the least meant I could use the self-catering kitchen, showers and drying room. This is my favourite hostel – being the first ever YHA – and it’s mountaineering history is proudly displayed in glass cabinets. I woke up at 5:30am, cooked a breakfast and left Idwal Cottage. I walked East along the road to the end of the lake which was an easier warm up than the proposed route round the back of the lake. The path takes you through National Trust farmland and into a bowl shaped enclave in the side of the Carneddau where there is a higher, smaller lake. I mistook the path here and ended up on the rocky crag on the wrong side. I did a combination of scrambling and bouldering to get back up to the path on top which rises nicely up the shoulder. This was a hair-raising moment but an exciting break from walking, with some steep-vertical drops. The shoulder gave me a stunning view of Tryfan across the road – a dramatic monument with that classic triangular mountain-shape. 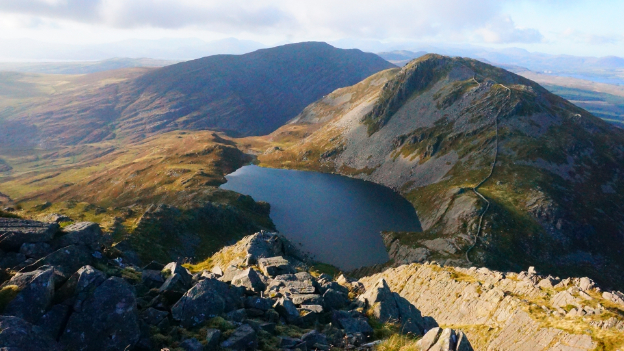 But it was the view from the top of Carnedd Dafydd (1044m) that took my breath away. From here you see the first sight of the North-West coast, including Anglesey, Bangor and some of the Llyn Peninsular. It was truly a moment I will not forget. However, the view tantalises you, your final destination remains obscured by the hulking mass of Carnedd Llewellyn (1064m) – the final big mountain of the walk. As I walked along this ridge – which in my opinion was one of the finest of the entire walk – several runners shot past me. I was mesmerised by how gracefully and effortlessly they glided over the terrain like antelope. I wondered if perhaps they were attempting the Welsh 3000s Challenge – a race to summit 15 of the highest peaks in Wales in 24 hours. 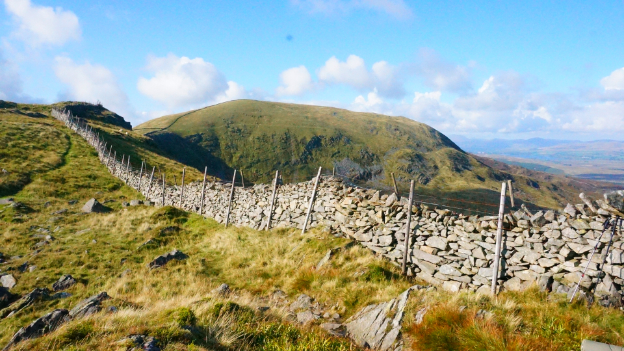 The rest of the walk from the major hills including Foel-Fras (944m) and Tal y Fan (610m) but the path drops and ascends steeply between, however the forward momentum that you have gained from the rest of the walk will surely propel you to Conwy in no time. I paced farm tracks and side roads towards Conwy, which to be honest were an anticlimax. I am not sure if I followed the traditional route here or made it up! Conwy was a pretty town, but overrun by holidaymakers. I felt disappointed – half expecting to meet the glorious expanse of the North-Welsh coast and arrive on a beach. Instead, the walk finishes at a railway station. I suppose that Tony Drake thought the first thing people would want to do when finishing this epic, exhausting walk was to promptly get the train home. He was right. I got on the train immediately. Within minutes I was hurtling back to Euston Station to see my sweetheart. I was beyond exhausted, but happy in the knowledge I had walked across a country.